Modineer is a leading manufacturer of steel and aluminum air reservoirs for the heavy-duty truck and trailer markets. We at Modineer utilize a highly efficient and flexible manufacturing process to produce a high-quality product that is catered to customer designs and industry specifications. Our tried and true process has been optimized over the past 27 years to produce the highest quality parts in the market. We do this in the most efficient manner possible, while still offering the flexibility to meet customer design needs. All air tanks are made to SAE J10 and FMVSS 121 specifications. Available diameter dimensions include tanks at 4”, 6”, 7”, 8”, 9.5”, 10”, 12”, 13”, 14”, 16”, 20”, and 24”. To ensure air tank durability, our in-house powder coating process includes three stages of pretreatment for 500 hours salt spray resistance. Such capabilities, along with an inventory of over 800 active part numbers, allow us to meet an array of custom design requirements. 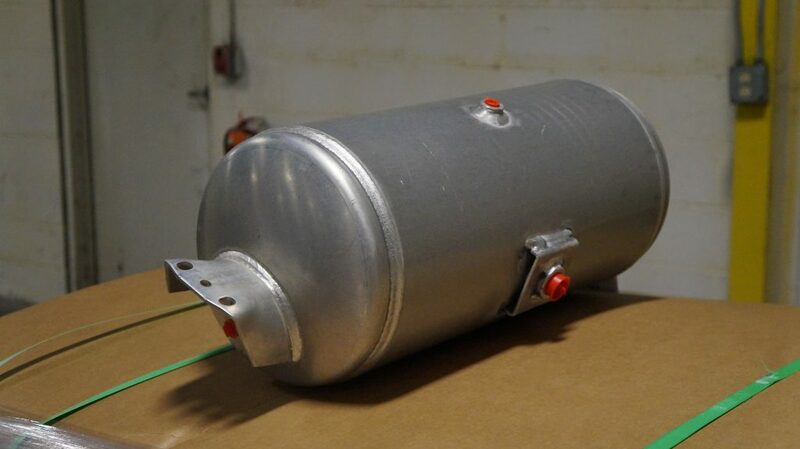 Modineer’s customers often leverage our other divisions to deliver pre-assembled air tank systems. These systems are shipped line side for assembly at their facility or ready to fulfill much-needed service orders. Modineer prides itself on producing cost effective parts to meet customer specifications, while also striving to exceed your service and quality expectations. With a veteran team of highly qualified customer service and manufacturing experts, we welcome all design ideas in order to make your stored air application function the way you want it to.